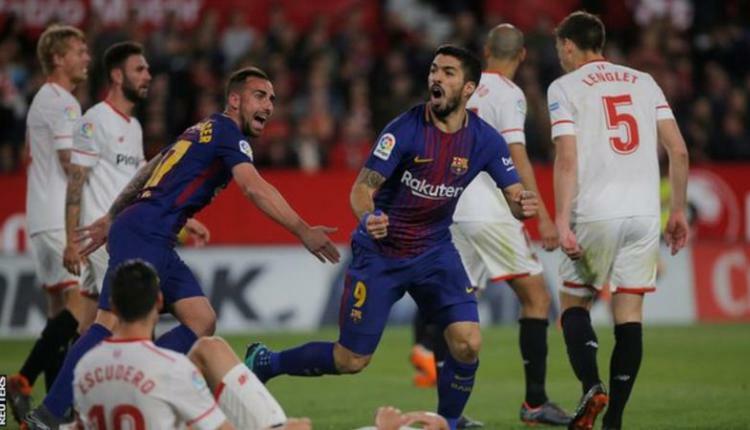 Luis Suarez scored his first Champions League goal in more than a year as Barcelona beat Roma convincingly in the quarter-final first leg. Ernesto Valverde’s side struggled for rhythm for much of the game against the Italian aide, but built a three-goal advantage thanks to own goals either side of half-time from Daniele De Rossi (40) and Kostas Manolas (55) and a tap in from Gerard Pique (59). Roma were able to get a goal back with 10 minutes to play as Edin Dzeko held off Jordi Alba while turning with the ball, and the Bosnian striker placed a low shot into the net. Barca are strong favorites to clinch their first semi-final spot since 2014-15 when they won the tournament, next Wednesday at the Stadio Olimpico. It was the away goal that Roma desperately needed, but the Italian side will still have to overcome a three-goal deficit in next week’s return leg in Rome as Suarez took advantage of some sloppy Federico Fazio defending to slam a fourth goal past Alisson in the 87th minute.